Put your mouse on me and push! First off, we've got a promo code for 5% off your order at Infinite Discs (the one and only supporter of my humble blog). The promo code is: HeavyDisc so click their logo above and give them a look. Promo should be good until June - so save some coin on your next purchase and please pay them a visit. 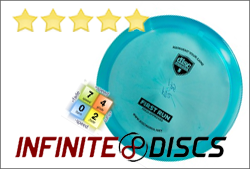 My pitch is short and sweet: Infinite Discs has been the sole beacon of support for this blog and by supporting them, I get to bring you these enthralling reviews. Thank you and now onto the goods! I'm no stranger to under-stable discs. The Innova Star Road Runner (167g) has been in my bag since my brother handed it down to me in the first weeks of carrying his hand-me-down bag. In the beginning of my learning curve - it allowed me to get some distance and consistency on drives even though I didn't have much power. Slowly I learned to throw with better technique (or so I thought) and I jumped up into more stable discs. When I would try to throw the under-stable stuff the disc would nose down and god help any worms that were poking their heads up for a look around. I thought I had out grown under-stable molds - but the reality was that I was getting away with bad technique because I was throwing over-stable discs. Furthermore, I incorrectly equated under-stable discs with beginner discs. Sure a beginner will struggle less with under-stable plastic, but that doesn't mean they're not incredibly valuable to your shot selection. It wasn't but just a handful of months ago that I went back to my under-stable discs and started working really hard on throwing them in the field. Those discs had sat idle as I had decided to just stick to forehands for my right breaking shots, but I was starting to find that the shape of my forehand and backhand was pretty drastically different. Re-learning to properly throw under-stable plastic was paying off in a big way in my technique and I started to see the value in two shots that had been completely eluding me. Hyzer-Flips and Rollers. Two shots that I equally love and fear. FEAR? Yes, fear. A hyzer flip can screw me two ways - by not flipping and then also by not fading. My rollers were wildly inconsistent - I have thrown them and watched them do much more harm than good more times than I can remember. They instill terror in my fledgling roller skills. That said, hyzer-flips have been some of the longest drives I've thrown and I really enjoy the beauty of that flight pattern and a shot that I use all the time. 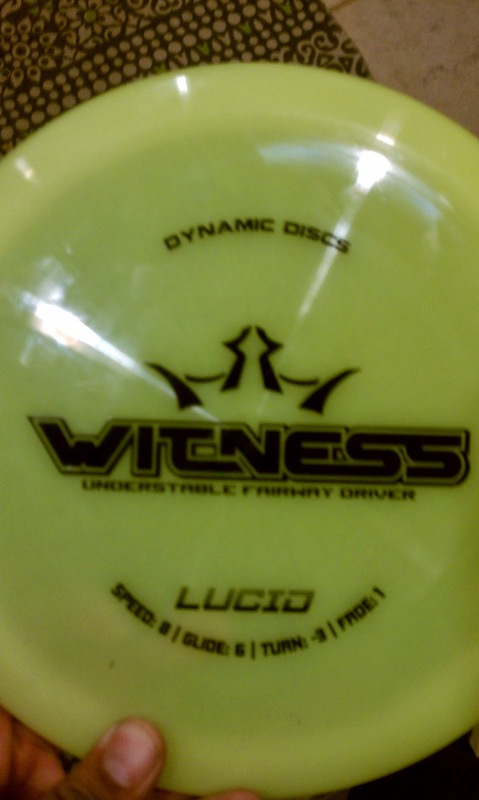 When Alan at Infinite Discs mentioned that he had the new Dynamic Discs Witness for me to review - I was really excited. The Renegade that he had sent me last time, immediately took over as my main driver. The plastic is just amazing, I can't be effusive enough about it - DD has done it right. Alright enough already, let's get to the disc. Power it up and go with a full power sky annie - and it is going 350' almost the entire way breaking right, with about 5' or fade at the end. Wow. I run down to grab it, leaving my stack of other discs behind and giddy. Rollers: Smoother and easier to roll than anything I've ever thrown before - rolls straight as a arrow and drops to the ground with a little break to the left at the end. Hyzer-Flip: At first, I didn't quite hyzer it enough, so I got quite a bit more turn than I wanted, it just avoided a treeline along the right side - and skids to the ground 400' out. Adding more hyzer - I got a much more straight line out of it and consistent distance. Powered down drives: dead nuts straight w/ almost zero fade... control city. Head wind? No chance and not at all what a disc like this is designed for. Tail wind? Yessssssss. All that glide and a bit of added stability gained with a tail wind means that you get bonus miles in the air. It impressed me and it was really exciting. I was getting the same distance as I could with my stable drivers, but by a drastically different line. My mind was already putting this disc to work on a few holes on my home course. I left day one impressed and excited. I decided to throw this disc on every hole at my home course of Paco Sanchez in Denver - along side whatever I'd normally throw. Trial by fire. Over and over that annie line just stayed consistent. There's something really exciting about having a long right-turning route available to you. The glide rating of 6 is legit. It has that same hover board feel as the Renegade. I want to bring up two holes in particular that puts this disc in my bag permanently. Hole 4 offers up 2 obvious lines from the tee pad to make the 375'-ish basket. You can throw to the right of some trees and take the slightly longer route out and fade back to left. Secondly, a more direct line to the left of the trees that requires some right turn to keep it on line. The Witness went to the left of the trees, the Renegade went right. Both ended up sitting 5' apart by completely different lines. Of course I missed my putt, but that's another story. Second hole was #6 (seen below) which is a downhill shot to the right 303' - which I have rarely birdied, because the basket sits right on the edge of a river - which is VERY easy to over shoot and end up wet, lost or both. A straight shot at the basket is really tight. Forehands skip into the drink. Typically I just play this hole safe - throwing stable plastic backhand that won't turn into the river right at the big evergreen in the pic below. It makes for a putt that's typically 40-50' and outside my range. I've tried a number of routes, sometime successfully, but always with greater risk of OB and lost discs when the river is high. Backhand with the witness right down the gut, it starts it's turn - it does it's thing - and skids up to the bucket. I am a fan of not having to putt! The very first round I played with my brother, he told me that discs won't matter for a while as I learn to just throw properly - then they matter more than you'll ever think possible. I think that I re-learned that little chunk of wisdom when I started playing with the Witness. Yes, you can get almost any disc to do anything you want - but it is drastically easier to find a disc that's nature is to do what you want. Ultimately this disc will be a great option for backhand anhyzers, rollers, hyzer flips and powered down laser straight shots. And quick update from last night's tags match. 10 mph tail wind - slightly down hill on hole 17. I reached for the Witness hoping the tail wind was enough to keep it straight. 450' by google earth's measurements and a solid 100' further than I've thrown that drive before. Let me be clear, I can't throw 450' on flat ground and I can't throw 450' w/out that bonus tail wind - but having the right disc for the conditions got me that distance. My buddy Big Mack walks up and shouts at me, "THAT WAS YOUR DRIVE?!" It's in the bag and staying there! Nice! Always great to hear success stories with new plastic. I appreciate the way that you tested your new disc, along side your normal shots. I find that very valuable information. I also appreciate the mention of the value of understable plastic. Watching the natural turn of a disc is one of the most gratifying things in disc golf. Understanding the angles, speeds, and heights required for hyzerflips and rollers can be challenging; especially if you over think it! But, once you have "learned" a disc you can utilize it to the maximum potential. My favorite understable disc is a 163 pro leopard. Shares a lot of the same characteristics you mention in this review: Laser straight powered down, hyzerflips, and long turn overs. 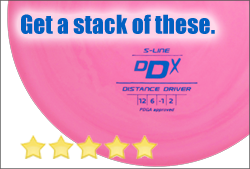 The speed is right in the sweet spot and you can make this disc work for you in so many ways! Thanks for the new post, I was craving some more Heavy Disc! I think the Leopard is probably just a bit less HST, but very similar. Thanks for the kind words Jordan - it's always awesome to see feedback and I appreciate it. How's it different than your Innova Star Road Runner? Seems like they'd be pretty similar, unless your RR is beat in so much that it's even flippier. My new and only champion Road Runner does not fly like it's numbers suggest. I'd say it's more like a HST = -1 and LSF = 1.5 at this point. I'm new to the sport, but it seems like new Innova discs (not DX plastic) need to be broken in to start flying as advertised. My Latitude 64 discs, and my Vibram discs, seem to match their numbers better right out of the "box." It seems like your DD Witness showed up flying like a Road Runner would after a break-in period. 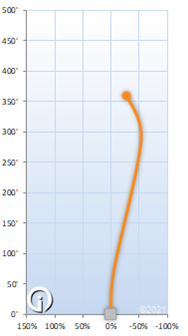 I use a Latitude 64 Vision for most of my fairway understable shots, but it has quite a bit of LSF. I have the same situation going on with a few other discs - an old pro firebird and an old XL. I don't quite have a disc yet flies like the Witness, and I'm wondering if maybe I can skip the break in period on my Road Runner (and new Sidewinder) and just jump to the Witness. I've not thrown a new RR. My 167 RoadRunner is pretty beat (came to me that way) and it turns substantially more than my 171 Witness out of the box. It also comes down to hard you're throwing it. There is definitely breaking points with my US discs - one where it will flip and then one where it won't fade. They're both going to be nice - and IMO different flights - and also I've seen much better results with rollers using the Witness. I've also slammed a few trees with the witness in the last week and it's showing more HST already... so yeah, it's pretty much a continually changing evolution. I'm still too new to disc golf to be able to anticipate much how discs will change and how quickly. I've been curious about whether the change each disc will display, assuming regular wear and tear, will best be described as: linear - steadily losing stability; discrete - jumping through a few different stages; a valley - a break-in period followed by a long life with relative consistency, before a rapid decline into understability; other. I'm assuming that the plastic type, weight, and even mold matter here, but I'm wondering if there's room for generalizing a bit. I'm also wondering if there's a shortcut to getting a disc to its prime break-in spot (if there is such a thing). Do I sleep with it? Do I throw it straight up into the air 100 times? Do leave it out in the sun? .... Just musing here. ... Thanks for the response. Break in time seems to be most related to the plastic type. Pro-D, DX - is going to take just a few hard ground or tree hits to see a change in the stability. Star can take tons of abuse and not change much at all. There's the two camps that seem to exist - cycling through multiple discs in the same mold, all in various stages of beat OR having a disc you like off the shelf that flies like you want. The problem I have most often is losing discs, so I want to be able to buy a replacement - and not beat one into the sweet spot, which could take time I don't really have. I've seasoned up my MVP Servo by taco'ing it 8 different ways and then spike hyzering it onto the ground. MVP is nice in that it will always go back to it's initial mold (other plastics won't). I've since lost that disc, but I'm going to replace it after my next trip to the disc shop - and I'll do the same to it. I tried a firm plastic MVP Anode putter at Phenix, loved it, and bought one. I wasn't mindful about the fact that the test putter at Phenix had been thrown probably 15,000 times. My Anode is quite stiff and slick; and it feels nothing like the one I had tried in the store, which was actually quite soft in the hand and conforming to my thumb's pressure. Is it true that MVP plastic softens with time, and doesn't chip and scar as much as DX or Champion plastic? So far my experience with my Vision is similar to what you stated above about US discs: first the HST increases, then the LSF starts to vanish. I think I'll take my Roadrunner out to a field today and throw hyzer spikes until its flight looks a little more like its flight numbers. Then I'll have a disc that fills a hole in my bag. I've got 4 anodes (lost one) and an Ion. MVP plastic does beat in, but not nearly as easily as DX. It's more along the lines of champion. The difference between their "regular" and "soft" seems to have changed over time. I have one regular that is almost a soft, then I have a newer regular that's rather rigid. Hit me up and let's throw a round. Question: I am a medium power RHBH player and Hyzer flip a lot. I flip a putter up to 220' or so, a comet 260 and a glide almost 300'. But I have never been able to find a driver, or even a fairway driver that will flip for me to get me up over 300'. I just go back to my stronger flick or Anhi Backhands. Any reason to think a Witness could fill the gap. I would definitely think that a 160-165 Witness would definitely work for medium power hyzer flips, especially as it beats up. The classic choice are a lighter Leopard (not in champion plastic) or a Sidewinder, both of which I've thrown as well. The witness is also a great option though. Try that link to see some options from Innova... I've got a buddy who like the Legacy Patriot too. Wow your article very informative . Thanks for sharing such a useful post. Bannerizer made it easy for you to promote ClickBank products by banners, simply go to Bannerizer, and grab the banner codes for your favorite ClickBank products or use the Universal ClickBank Banner Rotator Tool to promote all of the ClickBank products.